The Al Qasimi royal family (spelled sometimes as Al Qassimi or Al Qassemi; plural: Al Qawasem القواسم and, archaically, Joasmee) are one of the six ruling families of the United Arab Emirates (UAE) and rule two of the seven emirates: Sharjah and Ras Al Khaimah. The dynasty claim to be descended from the Prophet Muhammad. The Al Qasimi emerged as a maritime power based both in Ras Al Khaimah on the Southern shore of the Persian Gulf and Qishm, Bandar Abbas and Lingeh on the Persian shore in the 18th-century. The Al Qasimi control of trade in the Persian Gulf area led to conflict with Oman and eventually with Oman's ally, Britain, and to the Al Qasimi being labelled by the British as pirates. This led to the identification of the southern shore of the Persian Gulf as the 'Pirate Coast', although following the General Maritime Treaty of 1820 and the 1853 Perpetual Maritime Peace, the various coastal emirates in the area became known as the Trucial States. Following decades of incidents where British shipping had fallen foul of the aggressive Al Qasimi, a first British expeditionary force embarked for Ras Al Khaimah in 1809, the Persian Gulf campaign of 1809. This campaign led to the signing of a peace treaty between the British and Hussan Bin Rahmah, the Al Qasimi leader. This treaty broke down in 1815 and, in 1819, the British mounted a second, altogether more successful, punitive campaign against the Al Qasimi in Ras Al Khaimah under William Keir Grant. The case against the Al Qasimi has been contested by the historian, author and current Ruler of Sharjah, Sultan bin Mohammed Al Qasimi in his book The Myth of Arab Piracy in the Gulf, in which he argues that the charges amount to a 'causus belli' by the East India Company, which sought to limit or eliminate the 'informal' Arab trade with India, and presents a number of internal communications between the Bombay Government and its officials, which shed doubt on many of the key charges made by British historian J.G. Lorimer in his seminal history of the affair. At the time, the Chief Secretary of the Government of Bombay, F. Warden, presented a minute which laid blame for the piracy on the Wahhabi influence on the Al Qasimi and the interference of British vessels in native affairs. Warden also successfully argued against a proposal to install the Sultan of Muscat as Ruler of the whole peninsula. Warden's arguments and proposals likely influenced the shape of the eventual treaty concluded with the Sheikhs of the Gulf coast. That 1820 treaty asserted, 'There shall be a cessation of plunder and piracy by land and sea on the part of the Arabs, who are parties to this contract, for ever.' It then goes on to define piracy as being any attack that is not an action of 'acknowledged war'. 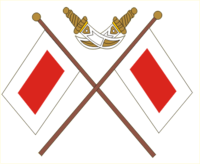 The 'pacificated Arabs' agreed, on land and sea, to carry a flag being a red rectangle contained within a white border of equal width to the contained rectangle, 'with or without letters on it, at their option'. This flag was to be a symbol of peace with the British government and each other. The treaty having been signed by Keir Grant and all of the Trucial Rulers, the Government in Bombay made clear that while it was happy with Grant's management of the military expedition, it was most dissatisfied with his leniency over the coastal tribes and desired, 'if it were not too late, to introduce some conditions of greater stringency'. Grant's response was spirited, pointing out that to have enforced extreme measures would have meant pursuing the chiefs into the interior rather than accepting their voluntary submission. This would have contravened Grant's instructions. In the end, Bombay allowed the treaty to stand. ^ "HH Sheikha Jawaher Bint Mohammed Bin Sultan Al Qassimi - Family". 12 May 2014. Archived from the original on 2014-05-12. ^ Lorimer, John (1915). Gazetteer of the Persian Gulf Vol II. British Government, Bombay. p. 1547. ^ "Al-Qawāsim | Arabian dynasty". Britannica.com. Retrieved 2018-12-05. ^ "Ruler of Ras Al Khaimah dies". This page was last edited on 21 March 2019, at 04:08 (UTC).